Shakespeare’s Measure for Measure is often considered a “problem” play for the way its central story—Isabella’s quest to free her brother Claudio from a death sentence—shifts between comedy and tragedy. I’m happy to report, however, that Groundling Theatre Company‘s production of Measure for Measure is a funny, sophisticated, moving, and simply wonderful modern-dress adaptation. From the intimate and effective staging at the Winter Garden Theatre to the superb performances by the entire cast, this was truly one of the best Shakespeare productions I have ever seen. There were many laughs to be had at Measure for Measure: the hilarious exchange between constable Elbow (Mark Crawford) and “bawd” Escalus (Patrick Galligan), the delightful Pompey (Steven Sutcliffe) cheerily telling prisoner Barnadine (Mark Crawford) to rise and be hanged, and—I admit it—even the “bum” joke that Shakespeare slipped into the dialogue. At the same time, I was amazed by the extent to which Measure for Measure is a play for the present moment. Its central conflict revolves around Isabella (Michelle Giroux), a virtuous nun who faces a terrible dilemma: surrender her chastity to Lord Angelo (Tom McCamus), or allow her brother Claudio (Charlie Gallant) to be hanged. One of the play’s central concerns is whether or not anyone will believe Isabella over Angelo, which to me seemed like a still-too-relevant problem. Groundling Theatre Company‘s production featured a female Duchess (the wonderfully commanding Lucy Peacock) rather than a male Duke, which I thought was an extremely effective gender-swap. My friend Jenna and I agreed that the gender change helped partially mitigate the play’s problematic ending. Every member of the company delivered a superb performance, but I was especially captivated by the dignity that performer Michelle Giroux brought to Isabella. Measure for Measure was staged at the Winter Garden Theatre—a beautiful Edwardian theatre—and the audience was seated on the stage facing the empty house. I loved the intimate atmosphere of this performance (only 149 tickets are sold per night), and the fact that I could see every flicker of emotion on the performers’ faces. I will never forget the magical moment when the house was illuminated by hundreds of lanterns. 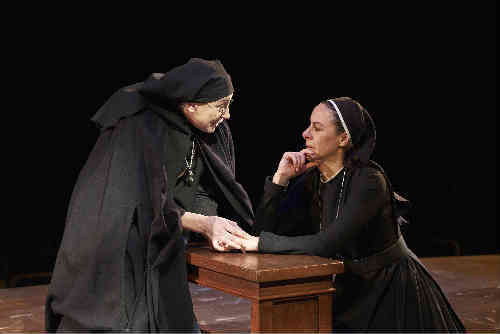 Overall, this production revels in the comedic moments of Measure for Measure, but also embraces the play’s themes of virtue, justice, and authority. It grapples with problems that are more relevant than ever: the balance between justice and mercy, the relationship between being a public figure and being in the public eye, and the need to make terrible choices and live with the consequences.